Let’s have a look at the past. ILIA Corporation, a management consulting firm in Iran wrote in a very interesting report explaining all the challenges Iran is facing, and give us some clues. The benefits of developing a domestic automotive industry are significant. The worldwide automotive industry is estimated to have a total cash flow of more than 2,790 billion USD with a total production capacity of approximately 90 million and it employs more than 48 million people (directly and indirectly). Accumulated this would make up for the 7th biggest economy of the world. The first Ford Model T’s arrived in Iran in the 1930s and by 1955 annual imports had soared to approximately 10,000 units. Nowadays the domestic Iranian automotive industry is estimated to have a yearly nominal production capacity of 2 million cars. It employs more than 1.5 million people (directly and indirectly) making up for 12% of the countries workforce. Furthermore it has a daily nominal production capacity of 10 million components whilst drawing input from sixty related industrial fields. With total sales of 12 billion USD it makes up for approximately 19% of the total industry, as well as for approximately 2.5% – 3% of Iran’s GDP. 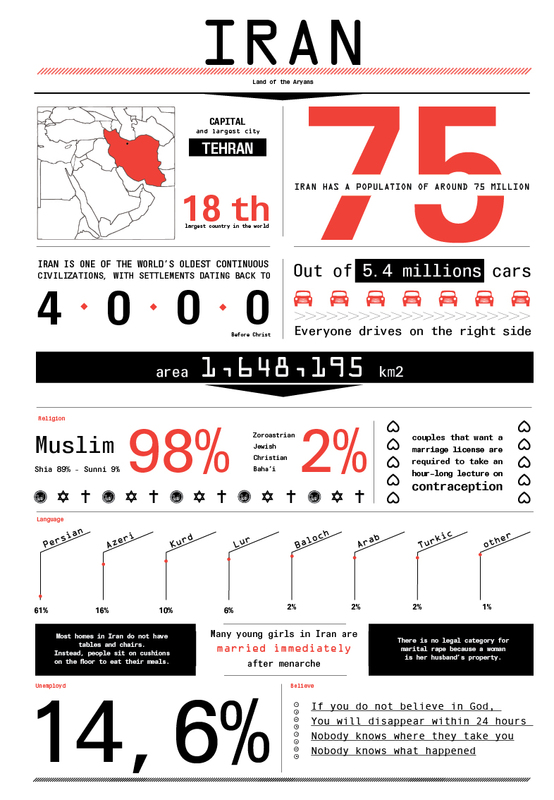 The Iranian automobile industry makes up for 1.2% of world production, and currently holds rank 18 to 20. Several national brands exist, such as IKCO, SAIPA, Pars Khodro, Kerman Khodro, and Bahman that produce a variety of different models (such as Samand, Tiba, Dena, etc.). IKCO and SAIPA are the biggest automotive manufacturers and together own more than 79% of the total market share. Iran also looks at its automotive industry as an important sector for exporting its products to neighboring countries. In 2012 Iran exported 520 million USD worth of automobiles and car components. The situation for car and component manufacturers worsened in the following years, leading to a diminishing export value by 2013 to 263 million USD. In 2014 Iran’s share of exporting automobiles and car components was announced to be at 243 million USD. There are several reasons for the drop, however, experts concur that the key reasons are low quality and at the same time a high price. Currently the Iranian automobile import market is ranked on 75th place worldwide, making up for less than a percent of the global automobile and component importing market share. In 2010, its market share was 0.2 percent with a total value of 2.5 billion USD. During 2011 the market share did not change, however, the total value of it increased to 2.9 billion USD. 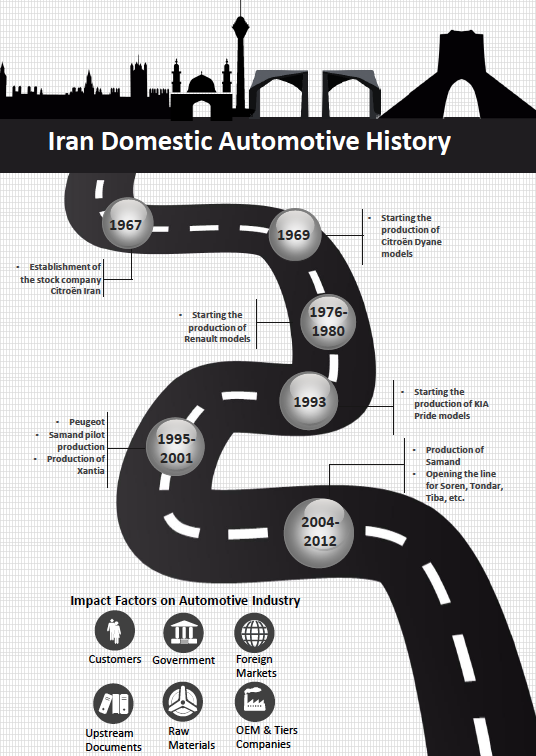 Economic sanctions were a big setback for Iran’s automotive industry, especially at a time when the industry was ready for major expansion. Since the year 2012 the production output decreased by approximately 50% (from 1.4 million to 0.7 million), whilst at the same time the price of cars increased radically by about 300%. Prohibitions and / or restrictions on: The import, purchase, transport, financing and insurance of Iranian crude oil and petroleum products; Transfers of funds between EU and Iranian banks and financial institutions; EU based sales, supply, export, transfer, purchase, import or transport of equipment or technology in relation to crude oil. 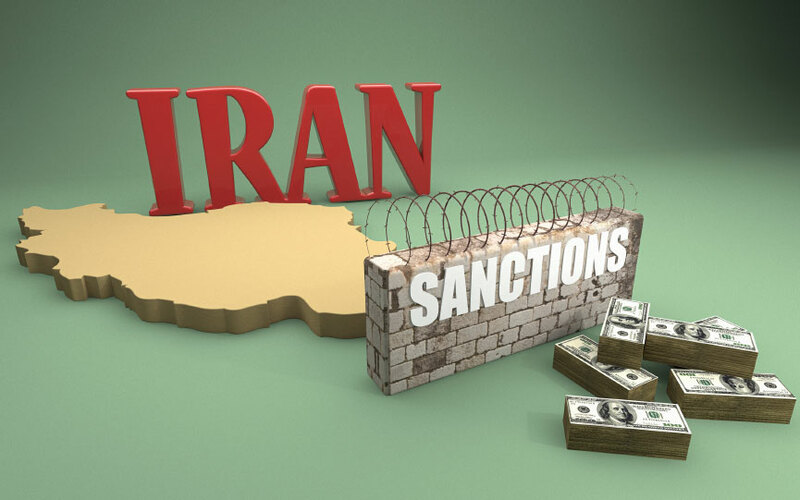 The US sanctions on Iran relate to:Iranian petroleum industry; Imports from Iran; Exports to Iran; Dealing in Iranian-origin goods or services; Financial dealings with Iran. 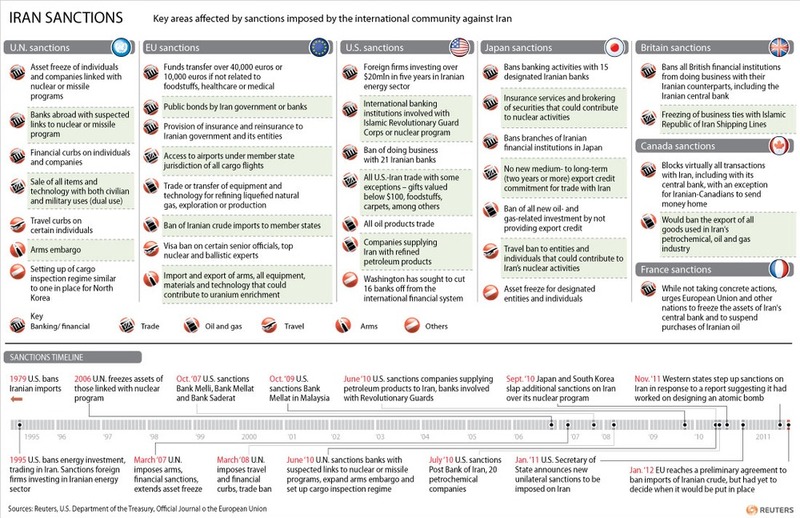 Despite the fact that Iran’s economy has been suffering from the effects of intensified international sanctions since 2007, different industrial sectors have shown deviating levels of instability. Since 2010, the Iranian total passenger car production dropped considerably, as a direct effect of the sanctions impact on the automotive sector. 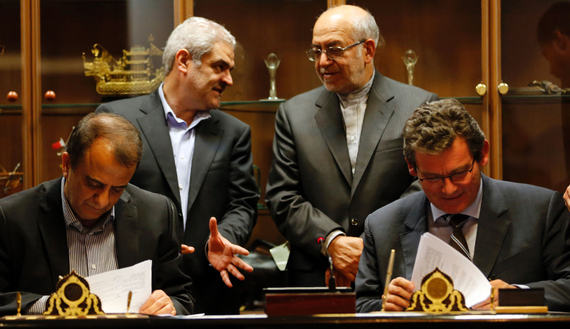 Deputy of France’s Peugeot Citroen (PSA) Jean-Christophe Quemard,(R) signs documents with CEO of industrial group Iran Khodro, Hachem Yekehzare (L), as Iran’s Industry and Commerce Minister Mohammad Reza Nematzadeh (2R) watches on in Tehran on June 21, 2016. PSA is the first Western carmaker to announce a return to Iran since many economic sanctions were lifted in January when a landmark nuclear deal with world powers took effect. Alireza Ramezani in al-monitor.com reports : „At the last Paris Auto Show, Renault Chairman and CEO Carlos Ghosn and Mohammad Reza Nematzadeh, Iran’s Minister of Industry, Mine and Trade, signed on a strategic agreement for a joint venture car-plant, where Renault is a majority shareholder. Iran Khodro and Saipa, Iran’s largest automakers, are other members of this agreement.“ Iranian hard-liners have launched a new attack on the administration of President Hassan Rouhani, this time focusing on the country’s automotive industry. At an Oct. 25 parliamentary hearing, the Industries and Mines Committee grilled Industry, Mines and Trade Minister Mohammad Reza Nematzadeh over a deal he made recently with the French automaker Renault. A new joint venture plant is being set up in Iran for making the Logan and Duster models. The Renault Kwid is currently under consideration for manufacturing in Iran, as the French carmaker eyes the potential of the Iranian automobile market (Iran is projected to be a 2 million-vehicle market by 2020). The JV plant will have an initial production capacity of 150,000 vehicles per year, and will adapt an existing plant in Tehran. Initially, this plant will make the Renault Symbol sedan (Renault/Dacia Logan) and the Renault Duster beginning in 2018. However, both Iran Khodro and Pars Khodro (a subsidiary of Saipa) are looking to manufacture the Renault Kwid. Bernard Cambier, Renault senior vice president and chairman-Africa-Middle East-India Region, in a recent interview to WardsAuto, stated that the Kwid, if made in Iran, will be “very successful”. Nematzadeh also came under fire over a controversial decision that critics say led to the import of 400 BMW, Toyota, Volvo and Honda vehicles manufactured in the United States, in contravention of guidelines barring the import of American-made cars. On Oct. 26, the Anvelope Vara (AV) published a report criticizing the import of US-made cars but did not refer to the hearing. Citing a number of pundits, SNN argued that the import had been unwise, because Washington’s “hostile” policies have for decades been damaging for Iranian consumers. “Cars that are made in the US, irrespective of whether their brand origin is American, European or Asian, create value added for American companies and boost employment in the US. We should not use Iranian money to create jobs for Americans,” Hassan Karimi Sanjari, an automotive expert, said in an interview with SNN. A day before the hearing, Donya-e Eqtesad, Iran’s leading economic daily, had reported that authorities had banned the import of European cars produced in the United States. The Industry, Mines and Trade Ministry, however, has not yet officially announced such a ban. Another concern among parliament members was the direct involvement of Nematzadeh’s ministry in the car market. Nematzadeh said that his ministry seeks to attract foreign investment in the automotive sector to upgrade manufacturing technology and provide Iranians with high-quality cars at competitive prices. He called Renault an “appropriate partner” that could can help Iran finish a key automotive development project given the company’s 12-year presence in Iran. Members of parliament called on Nematzadeh to obtain a guarantee from French automakers, including Renault, Peugeot and Citroen, that they will not repeat their “wrong behavior” of the past, Bastani said, referring to how Renault and Peugeot had pulled out of Iran in 2012 when economic sanctions intensified. A German business consultant who counsels a number of European and Asian carmakers operating in Iran told Al-Monitor that such guarantees are difficult to come by. “It doesn’t matter what type of contract you sign with a foreign company. If Iran comes under the same serious sanctions as before in the future, none of the European automakers will stay in the market,” the consultant said. “Stability is super important,” he stressed, while criticizing how numerous actors have a finger in Iranian market policy although such decisions need to be made by the Rouhani administration alone. Of note, in the last few months IKCO and SAIPA have resumed cooperating with Peugeot and Citroen. That three major partners in Iran’s automotive industry are French has raised concerns among some lawmakers about the future of the industry in the event of renewed external pressure. 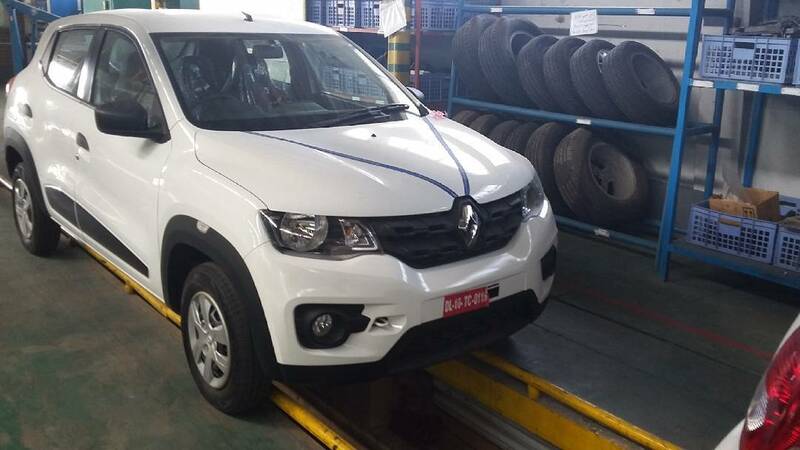 Under the IDRO-Renault contract, Renault is committed to producing 75,000 cars at Bon Roo, the manufacturing site previously owned by SAIPA before IDRO seized it as part of a debt settlement. The French company is also committed to investing in the site to double annual production in the next phase and eventually achieve an output of 300,000 vehicles a year in five years. Domestic automakers also complain that under current regulations, manufacturing vehicles whose technology is not yet fully localized is not economical, pointing out that producing such low-quality cars as the Tiba, Samand and outdated Peugeot 405 and Pride models makes much more sense than manufacturing the more advanced Logan (Tondar 90), which requires foreign parts. An open question : Will the US elections rebuff the game? In gulfbusiness.com, Erika Masako Welch explains : Iran opening up to the world is arguably one of the most prolific global business opportunities of our generation. For the majority of the largest European and Asian companies (excluding China), this marks a much-awaited opportunity to return to Iran, where many had investments, manufacturing facilities and large-scale operations prior to the financial sanctions made against Iran in 2011. Chinese and American companies view the current situation as more of a threat, and for different reasons. Chinese firms have greatly benefitted from the international sanctions on Iran over the past few years, which provided a window where an inflow of Chinese products flooded the market without much foreign competition. The lifting of sanctions will see an inevitable curtailing of Chinese dominance in this market. For American companies, the situation is more complicated. 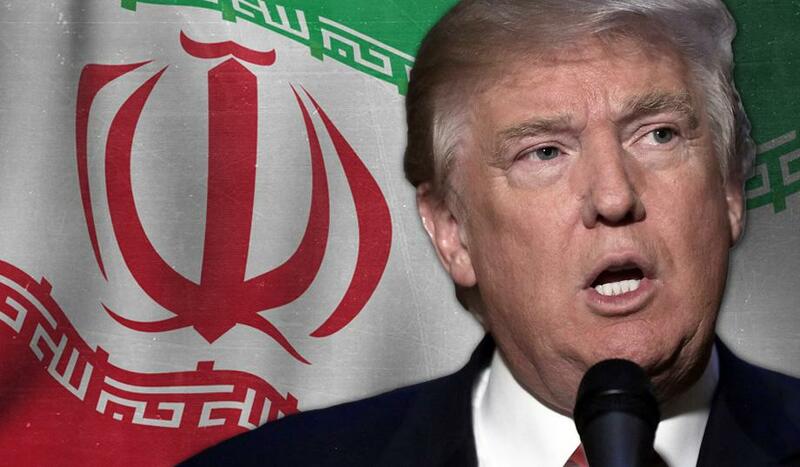 Although US companies’ foreign subsidiaries are technically allowed to engage with Iran, there is still a minefield of regulatory, transparency and legal challenges that have left many hesitant to take even preparatory steps. Furthermore, the fact that 2016 was a US Presidential election year, and the mounting layers of uncertainty of the future government’s policies towards Iran have left the majority of American companies unable to decide. Trump’s surprise victory is posing a potential threat to investments by Renault and PSA in Iran. During his campaign, the real-estate tycoon pledged to unpick the North American Free Trade Agreement (NAFTA) as well as a breakthrough nuclear pact with Tehran, saying both were among the worst deals ever made. Next article : Trump’s Election may or may not damage global auto trade?